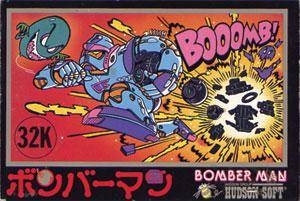 Bomberman (ボンバーマン, Bonbāman?) is an arcade-style maze-based video game developed by Hudson Soft. It was first released in 1983 for the MSX, NEC PC-8801, NEC PC-6001, Sharp MZ-700 and FM-7 in Japan, and for the ZX Spectrum in Europe (under the English language title Eric and the Floaters, Spanish Don Pepe Y Los Globos). Bomberman spawned the long-running series with many installments building on its basic gameplay. 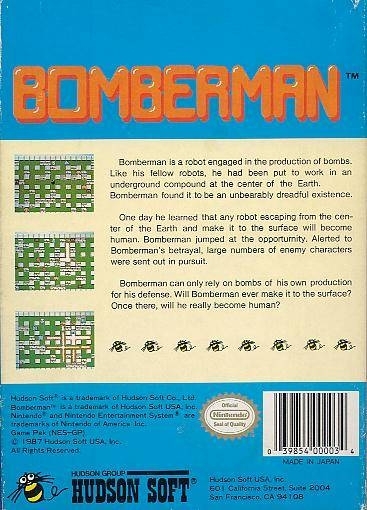 The original Bomberman is a robot forced to work at a bomb factory. He is the best bomb maker there. Bomberman starts growing bored of making bombs in a factory day in and day out. He hears a rumor that any Bomberman that makes it from the underground factory gets a wish. Bomberman, desperate to escape his job, sets out on a journey to the surface and to turn Bombermen into human bombermen, using his wish. The only thing standing in his way is the factory security guards who will do anything to keep the factory working.